In this second novel of Alison Weir's epic Six Tudor Queens series, the acclaimed author and historian weaves exciting new research into the story of Anne Boleyn, Henry VIII's most infamous wife, a woman ahead of her time whose very life—and death—forever changed a nation. Born into a noble English family, Anne is barely a teenager when she is sent from her family's Hever Castle to serve at the royal court of the Netherlands. This strategic move on the part of her opportunistic father also becomes a chance for the girl to grow and discover herself. There, and later in France, Anne thrives, preferring to absorb the works of progressive writers rather than participate in courtly flirtations. She also begins to understand the inequalities and indignities suffered by her gender. Anne isn't completely inured to the longings of the heart, but her powerful family has ambitious plans for her future that override any wishes of her own. When the King of England himself, Henry VIII, asks Anne to be his mistress, she spurns his advances—reminding him that he is a married man who has already conducted an affair with her sister, Mary. 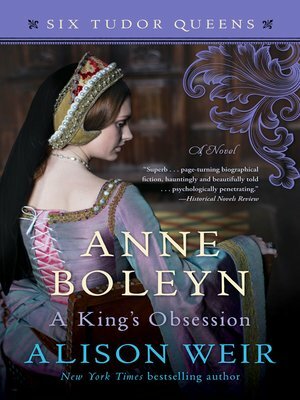 Anne's rejection only intensifies Henry's pursuit, but in the absence of a male heir—and given an aging Queen Katherine—the opportunity to elevate and protect the Boleyn family, and to exact vengeance on her envious detractors, is too tempting for Anne to resist, even as it proves to be her undoing.